We could open this paragraph explaining how far mobile graphics have come. And that would be about right: gaming laptops were once a joke; today, that’s no longer the case. But the recent developments in this category of products are a total game changer, and you’re about to find why. 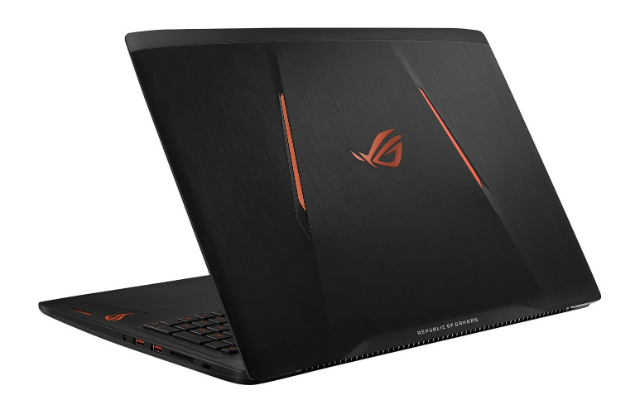 We are looking at the review of the ASUS ROG GL502VS-DB71 this time, a 15.6 inch gaming laptop that packs the latest from everyone, including Intel but, most importantly, the new graphics card from Nvidia. Let’s see what this is all about. You won't mistake the ROG GL502VS-DB71 for something else than a gaming machine thanks to its black body mixed with red accents, including the lighting in the backlit keyboard and the now familiar ROG (Republic of Gamers) logo from Asus. We also find that this is a very slim system at just 0.94 inches thick, and a modest weight of 4.9 pounds. As for the screen, there are very good news here, especially for gamers. Asus stuck with a 1080p panel on this one, the best balance since putting a higher resolution could hurt gaming performance. The screen is also matte, so reflections won’t bother you, but the best part is that it is IPS (for viewing angles) and also comes with Nvidia’s G-Sync technology, which will improve how your games look getting rid of things like screen tearing. Games rely heavily on graphics, but CPU is also important. Besides, you’ll probably be using this for much more than just games, don’t you think? Fortunately, here we find an Intel Core i7 6700HQ processor included. This quad-core 2.6 GHz (up to 3.5 GHz) chip belongs to the latest Skylake generation from Intel, and it sits on the highest category of mobile units. That means all kind of tasks are possible with this powerful processor. Gaming will, of course, benefit from this on the ROG GL502VS-DB71, as well as intensive applications. Top that with the 16 GB of DDR4-SDRAM (2133 MHz) included, and you won’t have to worry about doing several of those things simultaneously. And now it’s time to talk about what really matters for a gaming computer. The ROG GL502VS-DB71 comes with an GeForce GTX 1070. Yeah, you read that right. That’s “1060” without the “M” that labels it as a mobile GPU, and that’s because this is the same graphics card used for desktop units. Nvidia has just launched this all-powerful line of GPU for laptops, and the game (as well as the games) has changed forever. Modern AAA games are playable in at full resolution basically at the highest possible settings. According to NotebookCheck benchmarks, for example, some tougher titles like The Witcher 3 can be a bit more demanding (although they’ll still run fantastically), but expect to play at a consistent 60fps in every game you try. This is the real deal, there’s no compromise whatsoever. The ROG GL502VS-DB71 gets its juice from a 4-Cell battery that Asus claims will get you up to 5 hours of battery life. It’s worth noting though, this will vary wildly depending on what you’re doing, and it's always healthier to expect a bit less than what’s advertised. Still, battery life is never a focus for gaming machines, so we have to keep that in mind. On the connectivity side, we can say that one of the most valued features in gaming hardware is a decent video connectivity. Fortunately, that’s the case here thanks to both the HDMI and the mini Display Port available, the later which supports resolutions higher than 1080p. That also extends to the USB Type-C included, as well as three other USB 3.0 conventional ports. There’s also the basics: audio jack, SD card reader and even an Ethernet port if you plan on doing a LAN Counter Strike party. Just saying! We were pretty impressed with the storage, to say the least. First, we have a 1 TB mechanical hard drive with a 7200 RPM speed, much higher than the mediocre 5400 RPM most companies use. But as if that weren’t enough, there’s also a whooping 256 GB of flash storage, so what you essentially have is a fusion drive; the best for both performance and raw storage available. This might sound a bit too dramatic, but the overall conclusion of the ASUS ROG GL502VS-DB71 review is very simple: this is clearly a beast. There’s just not another word we can use to describe this laptop. From its aggressive aesthetics to its absurdly powerful internals, you won’t find a thing you can’t do with it. Even if you plan on gaming on higher resolutions with an external display, that’s perfectly possible thanks to the offer of ports it has. This year, everything changed thanks to Nvidia’s new strategy for mobile GPUs, which are now almost on par with the desktop models. And the ROG GL502VS-DB71 is one of the first machine to show us just what we can achieve on a 15-inch form factor. Spoiler: it’s a lot.